With Congress poised to grant President Obama the authority to negotiate free-trade agreements such as the Asia-centered Trans-Pacific Partnership, new data shows lawmakers gathering millions of dollars from pro-trade parties. According to data from researchers at MapLight, dozens of groups representing a variety of industries – ranging from the banking sector and insurance companies to electronics and food makers – donated about $218 million to senators since 2008, and that’s not counting senators who were voted out of office during the intervening years. Researchers said that the amount of money donated is roughly nine times more than groups who opposed free trade legislation donated to senators. Opposition groups have donated just over $23 million. Out of all the senators, Majority Leader Mitch McConnell (R-Ky.) received the most from pro-trade groups. He collected more than $8.2 million, while opposing groups only donated $11,000. Democrat Kirsten Gillibrand (NY), who voted against ending debate on giving Obama the ability to expedite the approval of trade agreements, was second on the list, accepting almost $6.2 million from pro-trade groups. Notably, three of the 10 senators who received the most money were “no” votes on “fast-tracking” the TPP – Gillibrand, Chuck Schumer (D-NY) and Minority Leader Harry Reid (D-Nev.) Overall, six of the top 10 recipients were Republicans, while four were Democrats. Those who agreed to give Obama fast-track authority generally received an average of $2.34 million from supporting groups. Opponents of fast-track donated the most money to Sen. Elizabeth Warren (D-Mass. ), who received nearly $2 million. While dozens of senators received more than $1 million from pro-trade groups, only six senators collected more than $1 million from anti-trade organizations. The controversial TPP deal would involve the US and 11 other Pacific Rim countries: Australia, Brunei, Canada, Chile, Japan, Malaysia, Mexico, New Zealand, Peru, Singapore and Vietnam. Supporters argue that it will boost the US economy and open up overseas markets to American goods, but opponents claim it will cost jobs at home, potentially subvert American regulations, hurt the environment and diminish internet privacy rights. 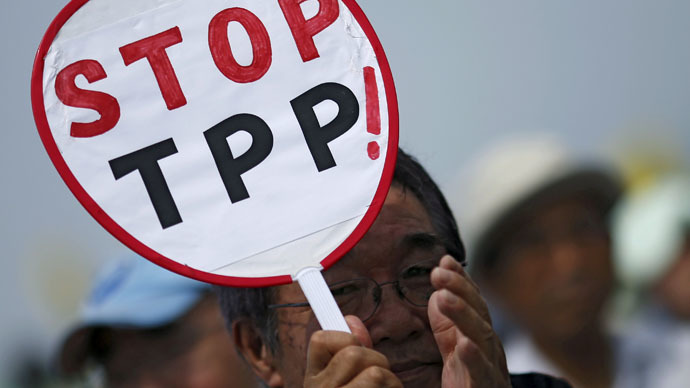 After months of grueling debate in Congress, the Senate voted 60-38 on Wednesday to give Obama fast-track authority, allowing him to submit a finalized TPP pact, as well as other deals, to Congress for an up-or-down vote. The House of Representatives already approved the legislation as well. Once Obama signs it, lawmakers will not be allowed to offer amendments to whatever pact the White House negotiates with TPP members. Obama has faced strong opposition from his own Democratic Party, with prominent lawmakers breaking ranks to speak and vote against the measure. Meanwhile, Republican lawmakers that usually oppose Obama generally backed the president on the issue.